Creech has flown the Predator since 1995 when it began its operational life. At the time, the base was called Indian Springs Air Force Auxiliary Field. That same year, the Predator deployed to Albania and the 11th Reconnaissance Squadron stood up in Indian Springs. The squadron, later joined by the 15th Reconnaissance Squadron, flew the Predator’s early missions, providing intelligence, surveillance, and reconnaissance for Operation Allied Force over the Balkans. The Predator became an armed, constant eye in the sky in 2001 as Operation Enduring Freedom kicked off in Afghanistan. It has flown constant m​​issions in the Middle East ever since, undergoing a series of modifications and upgrades to keep it combat relevant. The MQ-9 is getting a series of upgrades that will add new elements to its already diverse capabilities list. Presently the Reaper is used for surveillance or strike missions, and the USAF is trying to blend these two mission sets more smoothly together. The latest variant of the MQ-9 can fly upwards of 40 hours when not carrying weapons. The Reaper’s hardpoints give it the ability to carry a mix of AGM-114 Hellfire, GBU-12 Paveway, and now GBU-38 JDAM munitions. In contrast, its forbearer, the Predator, can only carry two Hellfires. Typically a Reaper’s external payload totals no more than about 2,500lbs on a strike mission, but that enables the Reaper to carry four Hellfire missiles and a pair of harder-hitting 500lb Paveways or JDAMs. In the future, guided micro-munitions will give Reapers a deeper and more flexible magazine. A variety of surveillance, fuel, communications relay, and electronic warfare pods, including Wide Area Aerial Surveillance (WAAS) camera arrays can and are carried on the Reaper’s pylons. These systems are supplemental to the drone’s nose-mounted MTS-B multi-spectral surveillance and targeting turret and its fuselage mounted Lynx synthetic aperture radar. The USAF is eyeing putting more powerful radar systems onboard some Reapers in an attempt to help build-out a ‘system of systems’ of ground moving targeting identification (GMTI) sensor nodes that can be distributed around the battlefield. The MQ-9 will also have the capacity to launch air-to-air missiles to provide a (limited) ability to protect the platform in contested airspace. More on the ‘sunsetting’ of the Predator from Major Joe Chapa at War on the Rocks here. The US Army will continue to operate its version of the Predator, the MQ-1C Gray Eagle. 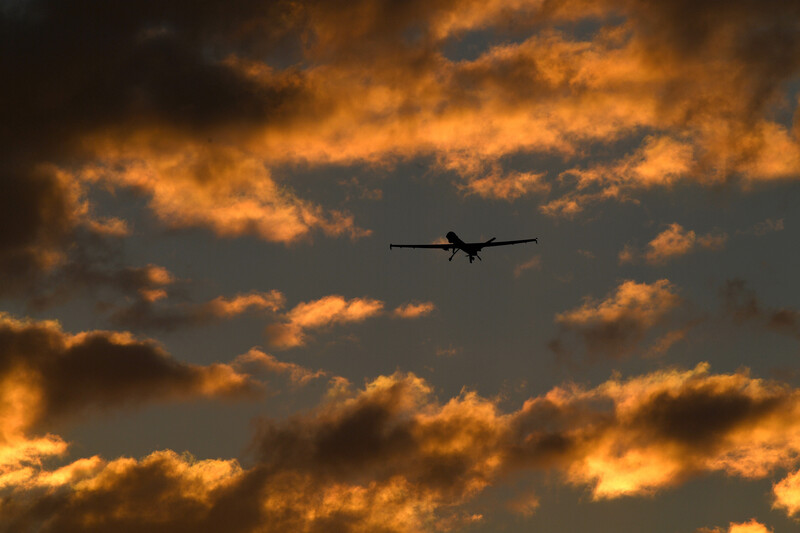 This entry was posted in air wars, drones, USA and tagged Creech Air Force Base, drones, MQ-1 Predator, MQ-9 Reaper by Derek Gregory. Bookmark the permalink.